Boil the water remove from heat pour in tea. Stir it and let steep for 15-20 min. Slightly crush the black peppercorn. Slice the beef roughly 220g/pc. Season the beef with salt and crush peppercorn. Pour in all the ingredients in vacuum bag with the sirloin and sealed it. Leave it for overnight in a chiller the flavor to synchronize. Remove the sirloin steak from the bag, pat dry. Season with a bit salt and grill the beef till medium. Let it rest 5-10min before slicing it. Thin sliced, placed aside. Or it can be guest preference for the meat doneness. In a mixing bowl place all the lettuce, kyuri, cherry tomato and kaffir lime leaf. Spoon few spoons of the sauce and tossed the salad. Season with salt and pepper if needed. Pour the Thai chili sauce and lime juice into a mixing bowl. Mix well. Can add more lime juice if need more acidity. 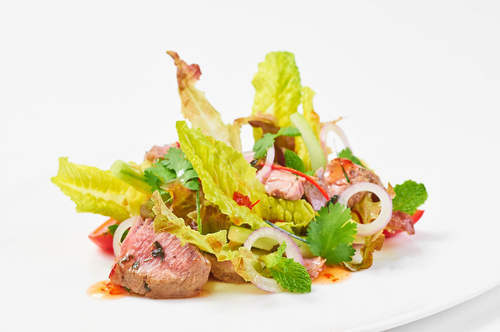 After tossing the salad line the lettuce on a plate, arrange the beef around the salad. Garnish with julienne chili, mint leaf and coriander leaf. Drizzle some of the sauce around the beef and salad.